Located in Cambodia’s Mekong Lowlands region, Phnom Penh is home to a whole host of fascinating landmarks. Still very much an up-and-coming city, new restaurants, bars, and hotels are constantly popping up, making the capital city it an exciting vacation destination. 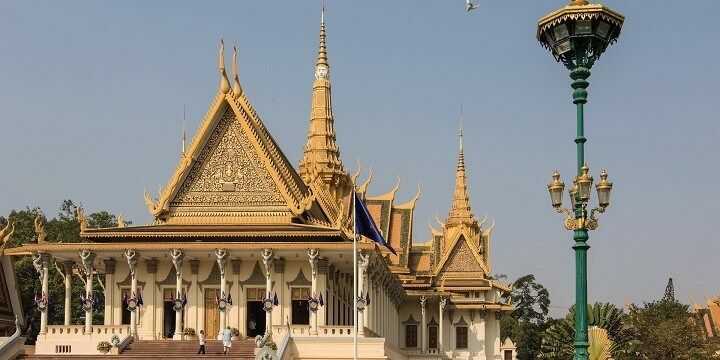 The Royal Palace, still home to Cambodia’s royal family, is among Phnom Penh’s most impressive buildings. The Royal Palace is the home of Cambodia's royal family. Erected in the 1800s in the traditional Khmer style, this landmark is a must-see for its beautiful grounds and intricate interior, especially in the Throne Hall, home to both the King and Queen’s grand thrones. Shorts and sleeveless shirts are not allowed in the Royal Palace, which is open daily from 8:00 to 10:30 and 14:00 to 17:00. 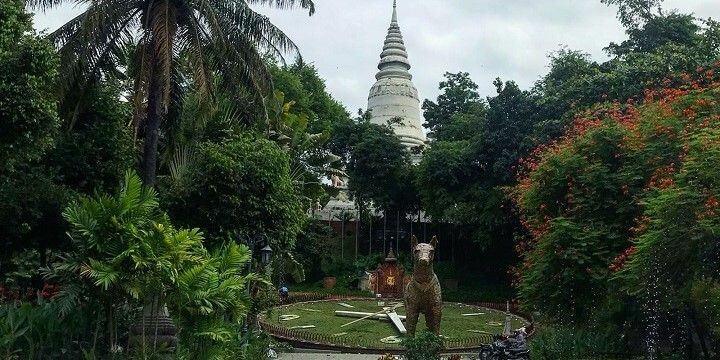 Next door to the Royal Palace, you’ll find the grand Silver Pagoda. This site is home to beautiful and fascinating murals, as well as a huge Buddha statue, known as the Emerald Buddha. Another must-see religious monument is Wat Phnom. Wat Phnom is a must-see religious monument. Standing at 27 meters above sea level, this landmark is located on the only hill in the city. The grounds host huge statues, intricate temples, and peaceful shrines, as well as an incredible souvenir shop selling goods made by local disabled people. More and more shopping malls are also popping up around the city. Aeon Mall, for example, opened in 2014, and is now home to an enormous range of brands, its own supermarket, an ice rink, and a movie theater. If you want a more authentic experience, head to the Central Market. Inspired by the art deco style, this huge market has four wings, selling everything from homeware to jewelry. The market gets extremely busy, so be sure to watch out for pickpockets! If the market is a little too crowded for you, fear not: the surrounding streets are filled with more great shops, including the Sorya Shopping Center. If you’re looking to buy some artwork, be sure to check out Street 178. Also known as Art Street, this unique road is home to galleries, and small shops, selling works from local artists and sculptors. Phnom Penh's nightlife scene is constantly growing. In addition to the shopping malls, the city’s nightlife scene is becoming bigger and better every year, yet Sisowath Quay — the main road running along the river — is still home to some of the most popular bars in Phnom Penh. Don’t just stick to the riverside, however, as you’ll find more affordable drinks in the quieter streets leading away from the busy Sisowath Quay. Sisowath Quay is the main road running along the river. Alternatively, check out Jet’s Container Night Market, home to a whole host of stalls, as well as karaoke bars, and pubs. Nearby, you’ll find Nagaworld, Phnom Penh’s own version of Las Vegas. The huge hotel complex hosts casinos, bars, restaurants, shops, as well as a huge array of entertainment. Don’t leave Phnom Penh without taking a day trip to the Tuol Sleng Genocide Museum and the Killing Fields of Choeung Ek. The museum, once known as S-21 Prison, was used by the brutal Khmer Rouge dictatorship to imprison citizens they considered as traitors during the 1970s. Many innocent people died during torture in the prison, while others were taken to be murdered at the Killing Fields. 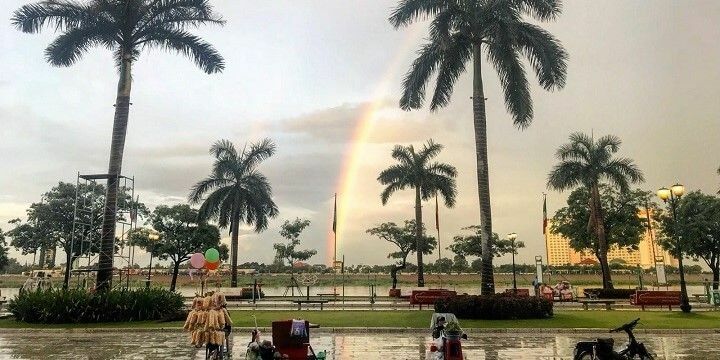 While the museum offers insightful exhibitions about the Khmer Rouge and its victims, it’s a good idea to use an audio guide around both of these sights to learn as much as possible about Cambodia’s history. If NextStop24 helped you to choose your next travel destination, we'd be very grateful if you’d search for your accommodation and things to do in Phnom Penh through these links. They're affiliate links, which means that we will receive a small commission for every booking made through them. There are no extra costs for you; you'll simply be helping to keep NextStop24 running. Thanks! Stay as close to the quay as possible (good restaurants and bars and the main landmarks). Expect quite dirty streets and dangerous roads. Great place to learn more about Cambodia's history, and more.